On December 2nd, the Traverse team had a big day, covering over 70 miles on the ice. The team ended their seventh day of the traverse, December 3rd, only 129 miles from Camp 20. On Tuesday, December 4th, on the ninth day of travel, the Traverse arrived at Camp 20. The team is now waiting for the Field Coordinator and a Mountaineer to arrive. They were scheduled to depart on a backup flight on December 5th, but the flight was canceled, and they are scheduled on a primary flight for December 6th. The SALSA Geophysics/SALSA EM team has continued productive work in the WISSARD grounding zone region. December 1st was a clean up day for SALSA EM, and the team worked on clearing the upstream end of their along-flow MT line, digging up the furthest three stations, and recovering a downstream station that was ready to move. After digging up half the MT array, they reinstalled two stations, focusing on their cross-flow line. As of December 1st, 12 MT stations had been occupied. Winds on December 2nd prevented the team from moving any of the stations that they installed the day before. As a result, they worked on more cleaning of the longitudinal line. They dug up the three remaining stations on the along-flow line, reinstalled two of them on the cross-flow line, and put fresh batteries on three other stations. The EM team spent the afternoon of December 3rd installing the final MT station on the main cross-flow line, putting fresh batteries on the other five deployed stations, and fixing a broken magnetometer channel on one of the stations. While installing the final MT station, one of electrodes’ pre-amplifiers (required to overcome the high-contact impedance of the ice sheet surface) stopped working. Because of windy conditions and snow machine problems, they decided to leave the station with a broken pre-amp and continue servicing the rest of the stations. Unfortunately, after they left the second of five stations where they successfully fixed the malfunctioning magnetometer, the thumb throttle of one of the snow machines broke in half, making driving very difficult. The team headed home to drop off the newly-broken machine, and Matt stayed at camp to work on fixing them (including arranging for parts to be sent from McMurdo) while Chloe, Kerry, and Meghan went back out with a spare pre-amp to get the last station up and running. On December 4th, excellent weather allowed the EM team to put new batteries on all six MT stations, and they found that one of the stations has anomalously noisy data. Their transit route for the day took them past an old radar-sounding location where Matt and a former colleague studied ice-shelf basal melt rates over a few weeks during the 2014-2015 field season. Matt took a new sounding at that site to capture the long-term melt rate over the past four years. After a highly successful day, the team returned to camp in time to watch the SALSA Traverse arrive. To welcome them to the neighborhood, Chloe baked fresh cookies, and Traverse Supervisor Steve Z rustled up a chocolate cake to return the favor. The team spent the morning of December 5th digging out their two furthest MT stations, and used parts from one of these stations to replace the logger and pre-amp hub on the station with anomalous, noisy data. 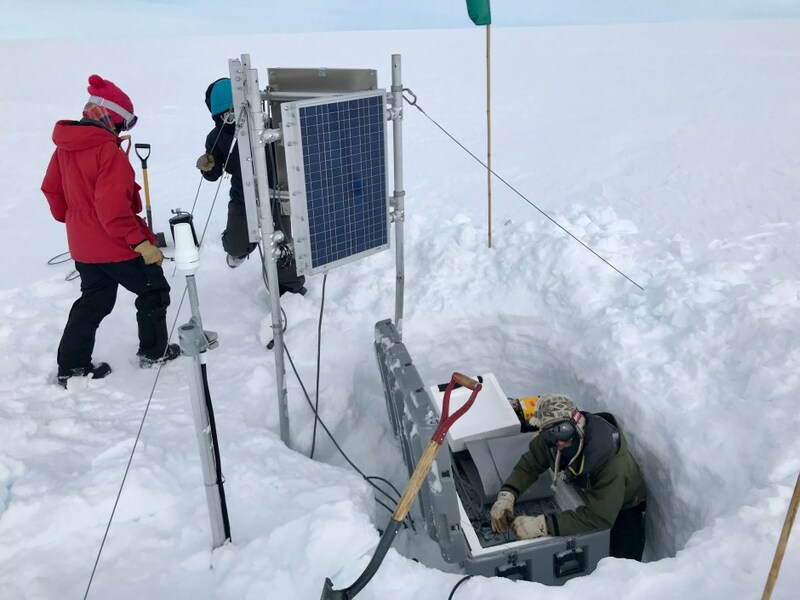 In the afternoon, they dug out two more stations and reinstalled one station along the cross-flow line toward camp, where earlier data suggested there may be significant two-dimensional subglacial structure. This is the final station installed in the grounding zone, bringing the total number of stations to 16. Members of the SALSA Drill Team pose for a photo with Chief Scientist John Priscu during the 2017-2018 field season. Senior Driller Dar Gibson and Drillers Anatoly Mironov and Edwin Krula arrived at McMurdo Station on December 3rd and began training for the season. Drill Team members Graham Roberts and James Roth also finished the wire winch encoder display. With most of the drill team now at McMurdo, the team is developing a plan for drill setup and strategy. The team is also writing an operating instructions manual. Anatoly and Dar are working on wiring Variable Frequency Drives (VFDs) for the wire winch, and James is working on load cell integration into drill controls.